A few weeks ago I baked and wrote a blog post about Ripon Spice cake. I am also trying to find, research and bake traditional and old Yorkshire recipes but I am not having much luck at the moment. Every time I Google Yorkshire recipes I keep coming up with Yorkshire puddings, Parkin or Fat Rascals. I’m sure there are more traditional Yorkshire recipes out there which have been long forgotten. The Ripon Spice Cake recipe came from a book given to me a couple of Christmases ago from my Dad and step-mum, a gem of a book called “Cakes Regional and Traditional” by Julie Duff. I also spotted a couple more unusual recipes in the book which I was keen to try out especially as I hadn’t heard of a lot of them. One such cake was called Yorkshire Cake but frustratingly I could only imagine what the cake looked like as it did not have an accompanying picture with it. In the introduction to the recipe Julie Duff says “This delightful recipe came from Mrs Gertrude Latter’s wonderful 1920’s handwritten cookery book. I thoroughly enjoyed making it and despite the slightly unconventional appearance of the cake, it did work and tasted very good,” This did make me wonder what the cake would turn out like! At first glance of the ingredients list it looked rather like a shortbread type recipe than a sponge cake one. One of the ingredients included ground rice, something I did not have and had to find in my local supermarket. I forgot to write it on the list though so I didn’t buy any. I suddenly remembered I needed rice flour when I decided to bake the cake! Oh no, what to do? In the end I substituted cornflour in place of the rice flour as you can do with shortbread. I preheated the oven and greased two 7″ sandwich tins. The recipe stated that you needed 2 x 6″ ovenproof plates, this is something I don’t have so I hoped the sandwich tins worked! Once these were ready I could begin to get the mixture ready. The butter and sugar was creamed together and then eggs and milk were added where I beat them together with a wooden spoon. After that plain flour, cornflour and baking powder was sifted together and mixed until it was smooth. Then I divided the mixture between the two tins. They baked in the oven for 20 minutes and were ready when risen and firm to the touch. Once they were removed from the tin onto the wire rack I left them to cool completely. 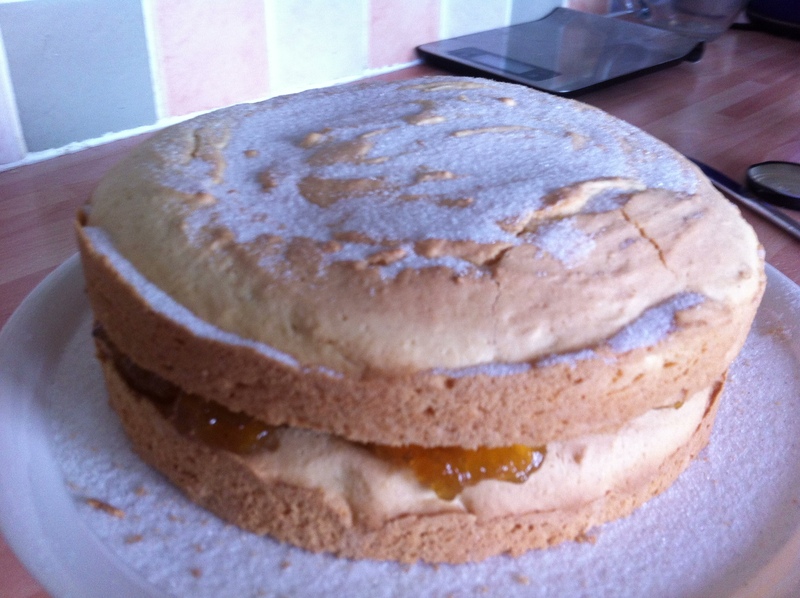 When the cakes were cold I sandwiched them together with greengage jam. I wasn’t sure why it had to be greengage jam but I managed to find a jar of it in my local Morrisons. It isn’t really something I buy but it looked nice. Finally, the cake was dusted with a generous sprinkling of caster sugar. Yorkshire Cake- a shortbread like layer cake sandwiched together with greengage jam and sprinkled with caster sugar on top. The cake looked pleasant enough so I decided to cut a slice and taste it. To be honest I didn’t really care much for it. The taste of the cake itself was quite cloying and the texture stuck to the roof of my mouth. I decided not to eat any more and put the rest of the slice in the bin. What a shame, it wasn’t what I was expecting at all. My daughter and hubby liked it though and my hubby ate some with a cup of tea when he got in from work. I don’t know if it was down to my baking errors or whether the cake was meant to taste like that. I will never know!